On a stop over earlier this year en route from Sydney to Berlin, I was once again reminded of the chaos that is Bangkok. I was relieved to read that the horrible recent floods in Bangkok are subsiding and life is slowly returning back to normal. I was recently thumbing through my tatty Moleskines full of notes and such from my 2011 travels. While Ziva is not a pure travel blog, I figured nonetheless that now was as good a time as any to bring my scribbled, muddled thoughts into some kind of coherent order and share them before the year’s end. A young teenage couple sat next to me, both wearing what was supposed be the school uniform of a preppy,international school but with a few,unauthorised after-school-additions: She had black high heeled leather shoes and sleek, GHD-ed hair. He wore a basketball cap, carelessly draped over his sheikh turban. His scuffed white Cons hit the floor while he whispered sweet nothings into her ear while she was oblivious, texting on her hello Kitty iPhone. On the other table next to me, was an old man, alone, his hands mottled with veins, his face showing the lines of his life, walking stick resting on the chair while furiously eating his pad thai. This scene could be anywhere. Yet it played out in a Bangkok shopping mall. Extreme tranquility and unpredictable chaos are symbiotic in Bangkok: one cannot exist without the other. In fact they feed off each other. The urban cacophany of tuktuks, motor bikes and cars have it out with the street vendors who concoct huge tureens of bubbling street food at every street corner. And every phlemmy hock of spit on the footpath requires a game of hope skotch to dodge.It is an incredible contrast to the calmness that was to be found in Thai temples and in the sanctum of my inner city hotel. While a saffron – robed monk can whisk past you at one moment, be prepared to get run over at the next. Slipping in and out of these two worlds is possible as I discovered. And I do not mean by making an offering at a temple or getting a massage at a day spa. I mean just hanging out at shopping malls. Spending a good few afternoons in a medley of different malls, I was not intending to do a sociological field trip yet could not help but notice how shopping and malls (at least in Bangkok) are a different breed of social past time. But what goes in malls is a microcosm of life outside, as any sociologist will tell you. I thought back to my French philosophy classes where we read the works of the leading intellectual of his day, Pierre Bourdieu. He did say that malls are representative as a space or ‘habitus’ for a certain social class. His theories do not simply analyse society in terms of economic classes and ideologies. Much of his work revolved around the role of educational and cultural factors. He applied this to many different fields – popular culture, music, sport. Anyways, in his 1984 work Distinction: A Social Critique of the Judgment of Taste (in French, La Distinction) Bourdieu claims that how one chooses to present one’s social space to the world—one’s aesthetic dispositions—depicts one’s status and distances oneself from lower groups. Yet the sheer mixture of people who spend time in these malls- anyone ranging from the the Khao – San road scroungy backpacker to the president’s children and their troupe – seems to blur the lines between all these different social classes. So much so, that one’s ‘class’ and level of education becomes mostly irrelevant.Maybe Bourdieu never made it to a Bangkok mall when researching his works. Most Bangkok locals view malls as a totally legitimate cultural and social experience – it makes it more than just a place where you get stuck in a time vortex: there is often a purpose in going there. Malls are Bangkok’s antidote to its own craziness: airconditioned, sanctioned calm in an otherwise chaotic, sticky urban jungle. Electronics, gadgets, food, fashion,cosmetic surgery, assisted reproduction, anti-aging services: there is a mall corresponding to practically every single categorisable need or desire in life. You can purchase unpronounceable, spiky tropical fruits or set up an appointment with a ‘Free Radical Removal Doctor’ or just perch and people watch. Many a family I spotted spending quality time together often with three generations, grandparents, parents and kids in tow. This is in stark contrast to the sad suburban malls in Sydney where a mother with a few wailing kids can calm them down with a Happy Meal at Macdonalds is her version of having a peaceful moment. Many people say that much of Bangkok’s charm lies in its quiet sois where sampling its street food served by cheeky, smiling people makes for an authentic experience. I wholeheartedly agree. But spending some time in a mall is also part and parcel of the Bangkok experience. If for nothing else, than just to get a dose of zen in the most unlikely of places. In what kind of other spots have you done the occasional sociological field trip? PreviousPrevious post:Why You Need to Learn To Dance and 9 Other Things My Grandmother Taught MeNextNext post:On a stop over earlier this year en route from Sydney to Berlin, I was once again reminded of the chaos that is Bangkok. I was relieved to read that the horrible recent floods in Bangkok are subsiding and life is slowly returning back to normal. I was recently thumbing through my tatty Moleskines full of notes and such from my 2011 travels. While Ziva is not a pure travel blog, I figured nonetheless that now was as good a time as any to bring my scribbled, muddled thoughts into some kind of coherent order and share them before the year’s end. _______________________________________________ A young teenage couple sat next to me, both wearing what was supposed be the school uniform of a preppy,international school but with a few,unauthorised after-school-additions: She had black high heeled leather shoes and sleek, GHD-ed hair. He wore a basketball cap, carelessly draped over his sheikh turban. His scuffed white Cons hit the floor while he whispered sweet nothings into her ear while she was oblivious, texting on her hello Kitty iPhone. On the other table next to me, was an old man, alone, his hands mottled with veins, his face showing the lines of his life, walking stick resting on the chair while furiously eating his pad thai. This scene could be anywhere. 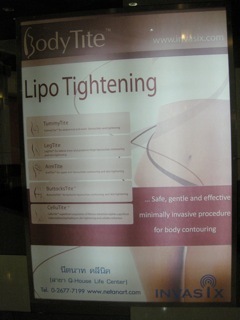 Yet it played out in a Bangkok shopping mall. Extreme tranquility and unpredictable chaos are symbiotic in Bangkok: one cannot exist without the other. In fact they feed off each other. The urban cacophany of tuktuks, motor bikes and cars have it out with the street vendors who concoct huge tureens of bubbling street food at every street corner. And every phlemmy hock of spit on the footpath requires a game of hope skotch to dodge.It is an incredible contrast to the calmness that was to be found in Thai temples and in the sanctum of my inner city hotel. While a saffron – robed monk can whisk past you at one moment, be prepared to get run over at the next. Slipping in and out of these two worlds is possible as I discovered. And I do not mean by making an offering at a temple or getting a massage at a day spa. I mean just hanging out at shopping malls. Photo pacoalfonso. Literally. Spending a good few afternoons in a medley of different malls, I was not intending to do a sociological field trip yet could not help but notice how shopping and malls (at least in Bangkok) are a different breed of social past time. Bangkok_malls_piece Photo guhru. But what goes in malls is a microcosm of life outside, as any sociologist will tell you. I thought back to my French philosophy classes where we read the works of the leading intellectual of his day, Pierre Bourdieu. He did say that malls are representative as a space or ‘habitus’ for a certain social class. His theories do not simply analyse society in terms of economic classes and ideologies. Much of his work revolved around the role of educational and cultural factors. He applied this to many different fields – popular culture, music, sport. Anyways, in his 1984 work Distinction: A Social Critique of the Judgment of Taste (in French, La Distinction) Bourdieu claims that how one chooses to present one’s social space to the world—one’s aesthetic dispositions—depicts one’s status and distances oneself from lower groups. Yet the sheer mixture of people who spend time in these malls- anyone ranging from the the Khao – San road scroungy backpacker to the president’s children and their troupe – seems to blur the lines between all these different social classes. So much so, that one’s ‘class’ and level of education becomes mostly irrelevant.Maybe Bourdieu never made it to a Bangkok mall when researching his works. Most Bangkok locals view malls as a totally legitimate cultural and social experience – it makes it more than just a place where you get stuck in a time vortex: there is often a purpose in going there. Malls are Bangkok’s antidote to its own craziness: airconditioned, sanctioned calm in an otherwise chaotic, sticky urban jungle. Electronics, gadgets, food, fashion,cosmetic surgery, assisted reproduction, anti-aging services: there is a mall corresponding to practically every single categorisable need or desire in life. You can purchase unpronounceable, spiky tropical fruits or set up an appointment with a ‘Free Radical Removal Doctor’ or just perch and people watch. Lipobangkokpic Many a family I spotted spending quality time together often with three generations, grandparents, parents and kids in tow. This is in stark contrast to the sad suburban malls in Sydney where a mother with a few wailing kids can calm them down with a Happy Meal at Macdonalds is her version of having a peaceful moment. Many people say that much of Bangkok’s charm lies in its quiet sois where sampling its street food served by cheeky, smiling people makes for an authentic experience. I wholeheartedly agree. But spending some time in a mall is also part and parcel of the Bangkok experience. If for nothing else, than just to get a dose of zen in the most unlikely of places. In what kind of other spots have you done the occasional sociological field trip?